Internal Affairs is expected to wrap up its police investigation soon. Apr. 24, 2018, 6:45 a.m.
As outrage and disappointment over the April 12 arrests of two black men inside the 18th and Spruce Starbucks continue to swirl, Mayor Jim Kenney wants the world to know that the City of Philadelphia is actively examining the incident, with the goal of enacting policies that prevent anything similar from happening again. In two statements released by the city last week, and again in an op-ed published Monday by PMN, Kenney extrapolated on what actions he and various other officials have taken or plan to take. Here are four things Philly is doing to address the Starbucks arrests. Part of the Philadelphia Commission on Human Relations’ purpose is to examine discrimination in the city — there’s a whole section on the PCHR website is devoted to the issue. Over the next weeks and months, the commission will be checking out whether or not Starbucks deals with cases of discrimination deliberately, and, if so, how the company can improve its practices to avoid future incidents like this one. Starbucks has said it will cooperate with the PCHR in providing formal policies for review. Other than a page laying out the company’s core values, there isn’t much out there on what happens internally when things go sour behind the barista counter. What is publicly available are ambiguous instructions on how to approach “obstacles” and “ethical problems,” including a note that encourages employees to reflect on how their decisions would look published in the media. Oh. Policies are likely to become clearer after Starbucks conducts the nationwide racial bias education training for which it will close all 8,000 U.S. stores on May 29. In his recent statements, Kenney confirmed that the PPD’s Internal Affairs Division has officially opened an investigation. In Monday’s op-ed, he said investigators will go over how the arrests were handled “at all levels”. What exactly “all levels” means remains vague. How far does the investigation extend beyond whether or not the presence of the cops that enforced the arrests was warranted? Will it also analyze the actions taken by PPD District 9 that day (holding Rashon Nelson and Donte Robinson in custody for eight hours)? Will Commissioner Ross receive some of the heat? Will IA also investigate the degree in which the officers involved were trained on implicit and unconscious bias? The scope is broad, but the mayor has indicated he expects the investigation to be completed by the middle of this week. The PPD has already drafted a policy regarding police responses for “defiant trespassing” — apparently, the policy for response to that crime was previously unspecified. Pennsylvania code also offers no specification of a defiant trespass policy from the state. Section 3503 (b) of Pennsylvania Statutes only includes language on what could be considered an act of defiant trespassing, and as what degree of offense it could be categorized. Other than assuming law enforcement has given “actual communication to the actor to leave” before punitive action is taken, there isn’t much else on how police in Pa. should lawfully address these possible infractions. Per an April 19 statement from the Mayor’s Office, the new Philly Police policy on defiant trespassing should be complete by the end of this week. Coincidentally, Starbucks also lacks straightforward guidelines on how to react accordingly to any behavior deemed “improper” (such as loitering or using a bathroom without being a paying customer). In fact, these decision-making policies seem to be inconsistent and enacted on a case-by-case, store-by-store situation. 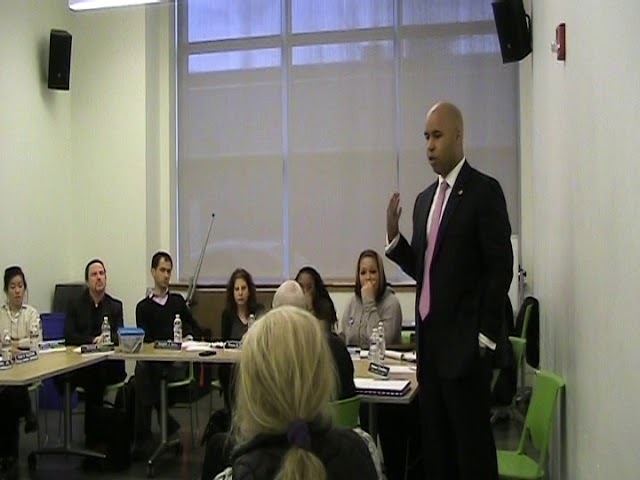 The Police Advisory Commission (PAC), aka the civilian oversight agency of the PPD, just conducted its public monthly meeting Monday in South Philadelphia. All PAC meetings are recorded and promptly posted on YouTube. Conversation regarding the Starbucks incident starts in the video below at 16:24, and continues through 18:30. “Effectively, there’s nothing on its face that says that these officers that responded were doing anything illegal, or that they acted against their job responsibilities, or that anyone involved was doing anything illegal,” PAC Executive Director Hans Menos said at the meeting. Menos confirmed that the PAC will be “working closely” on their review on “what occurred here” with Rue Landau, the Executive Director of the Philadelphia Commission on Human Relations. He is “not sure” of what the end result will look like.